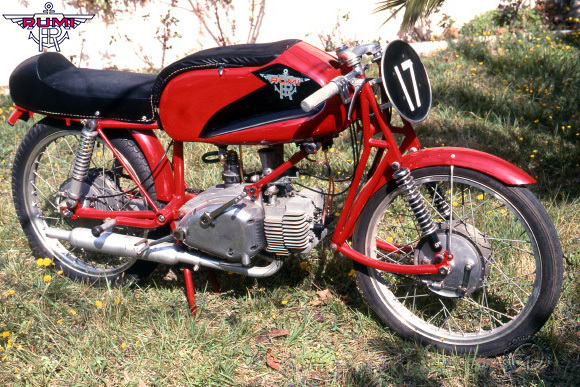 In 1955, Rumi- who concentrated on twostroke twin power units - made a racing machine designed for the regulations of the Italian Formula Junior Gentleman, which limited the carburetor choke to 18mm (0. 7 inches). Lean and lively, the Rumi Junior Gentleman became the favorite machine in this new category. Successor to the legendary Gobbetto, this client-competition machine was "domesticated" with street equipment so that it could compete in the classic Italian races like the Milan-Taranto. It also raced with distinction in events like the Bol d'Or in France and the 24 Hours of Montjuich in Spain. The basic power unit was the famous horizontal twin that powered the marque's scooters, but fitted with twin carburetors and either a straight through muffler or a megaphone exhaust. Throughout its racing career, the Junior Gentleman also served as a test, on which Rumi tried liquid cooling, rotary valves, electronic ignition and expansion chambers. Powerful, reliable and a pleasure to ride, this excellent spottster was superior to most 250s of its day. It had Earles front forks and benefitted from the highly-efficient hub brakes of its predecessor. The high performance flywheel magneto and the crankcases had been redesigned in the interest of better cooling. The Junior Gentleman remained in production until 1959. Also built in 175cc capacity, the Rumi junior Gentleman is one of the most collectable Italian competition bikes of the 1950s.